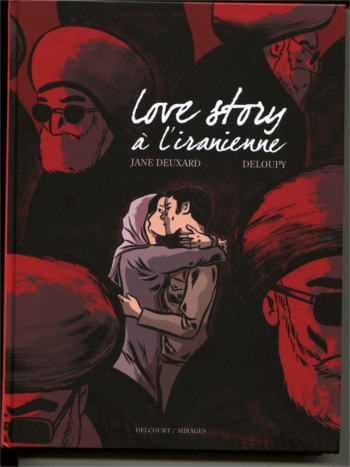 Love story à l'iranienne is a cartoon book about the submissive youth in Iran: their love, their hate, the snitchings and their expections from H. Rouhani. When it comes to Iran, the words most associated are: “a complex society”, “difficult to understand”. But things are much simpler. It is about a society that cheats with traditions, but will not let go. A cynical society, proud of its dreams but fearful of the realities and the genuine changes so much needed. 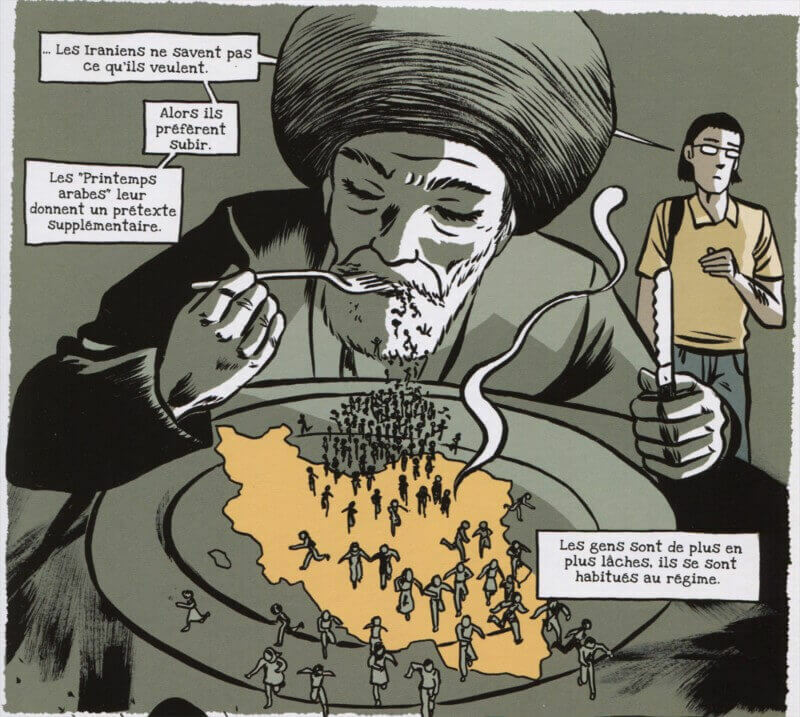 With powerful drawings and dialogues faithful to what is said and heard in Iran, Love story à l’iranienne is a great piece and provides much food for thought. It is something worth discussing as one ponders over the consequences of social reflexes under the ayatollahs, the social reflexes that enslave the youth instead of preparing them for their struggle for freedom. Two journalists, a man and a woman, report the testimonies on “how to be young in Iran”. For the publication, they took a pseudonym: Jane Deuxard. Why? 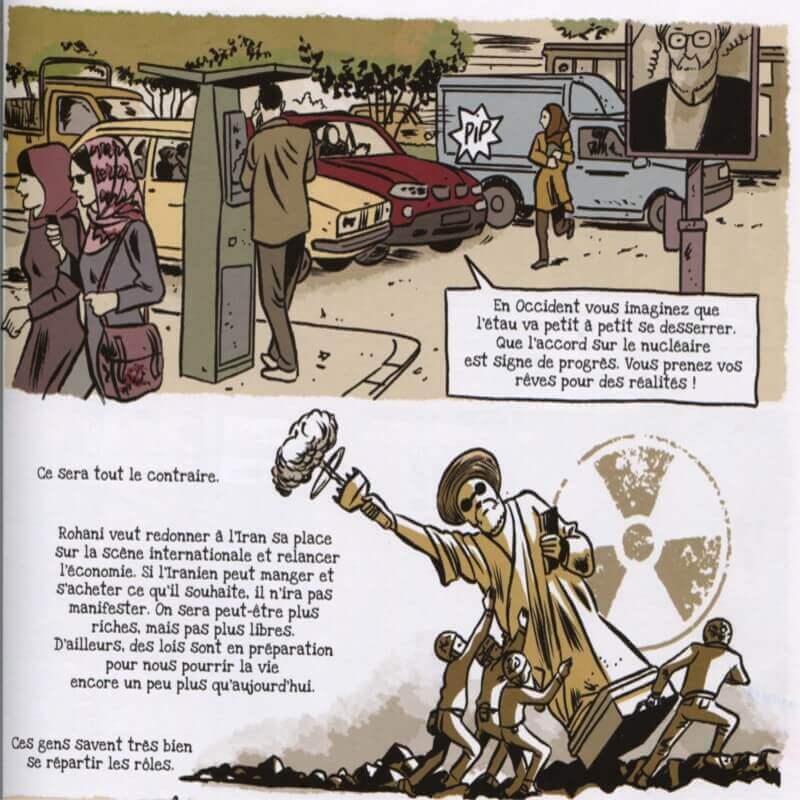 Why should writing and talking about the youth in a country be covered by a pseudonym? They have to protect their sources, and also themselves from the brutalities of the Iranian censors if they want to go back to Iran. Telling the truth and using direct speech are mortal sins in the Iranian context. Having little choice but to stay anonymous from Iranian authorities, even when one is living the West, speaks volumes about a closed society in which everything is political, even falling in love, and mild criticism of the regime can easily lead to a firing squad. Iran is an appealing country to Western visitors. It evokes poetry and Persepolis, and has welcoming people. It is so very easy to be seduced by its dangerous charm and be confident in one’s beliefs, till one is bitten by it and experiences “unpleasantness”, a euphemism for horror. Once in the country, one has to sharpen one’s sense of observation and questioning, and not easily give in to the clichés. A trap that the authors avoided beautifully. The young Iranian couples depicted in the book abide with the strict rules governing the separation of genders in public and also with the oppressive traditions of their families. Paradoxically, the private snitches – family, friends and neighbours – are as dangerous as the agents of Gasht-e Ershad, the Islamic morals militia. 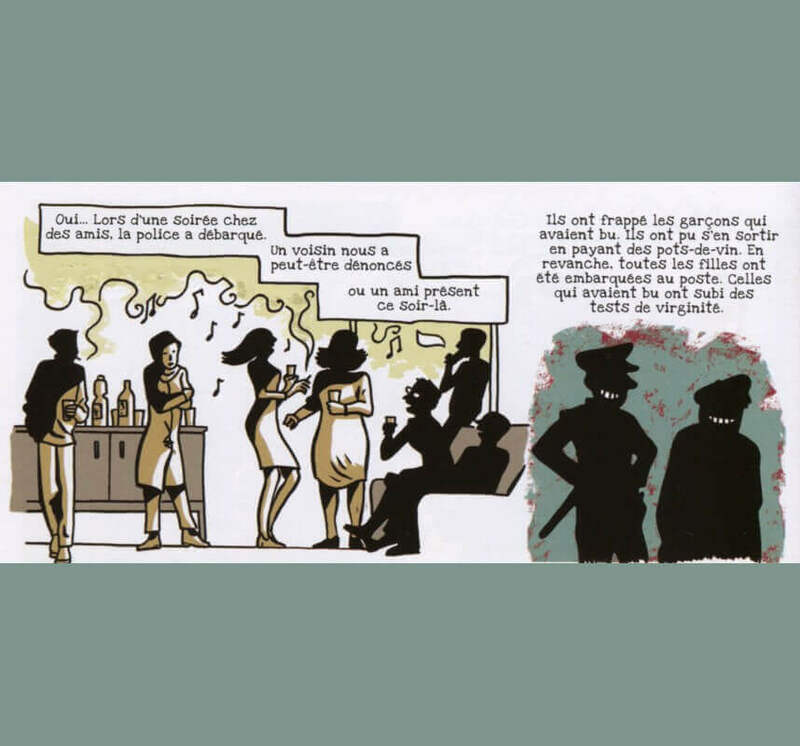 Love story à l’iranienne, as with L’Iranienne by Maurice Bigio (2012), gives a few clues to an understanding of today’s Iranian society more than any academic paper. No dictatorship thrives and no theocracy can impose its oppressive dogmas for so many decades unless it has the consent of the population. The consent need not to come out of a ballot box, need not to be a strong political declaration, loud and in many words. Silence, apathy, and mindlessly following a leader is consent. The worst symptom of the total submissiveness and surrender is when the Iranian denies facts and does not see past his nose. To make an Iranian express his ideas without the usual blah-blah of Taarof, is a tour de force. Each drawing by Deloupy is worth a thousand words, produced by a sharp intelligence. Below are three scenes we chose to highlight. The links to what we wrote earlier are produced. Similar ideas said in different ways. Iranians don't know what they want. Then, they prefer to be submissive. Perhaps a neighbour grassed on us or a friend present that night. If the Iranian can eat and buy what he wants, he will not protest. We might be wealthier, but not more free.